On May 2nd to 4th, 2018, the Alderney Needlearts Guild invited Margot Kearney, from London, Ontario, to come and teach our guild the art of thread painting (replicating a photograph using embroidery floss). Fourteen people from our guild and three from the Bedford Guild attended the three-day workshop. This was a new technique to all in attendance and was open to new and experienced needlers. Each member was asked to bring in a picture that they had taken. Margot helped us to chose the best one and provided us with the silk fabric we would use. Over the three days, various thread painting techniques were taught by Margot and by the end of the workshop everyone had a good start on their project. A great time was had by all. Submitted by: Shaureen T. and Monique P.
And Wendy M. finished hers; here it is! Wendy offered to teach a workshop for anyone wanting to give Temari making a try and several of us jumped at the opportunity. Temari is a Japanese craft where yarn is wrapped tightly around a base material such as old fabric, and then wrapped again with a layer of thread. 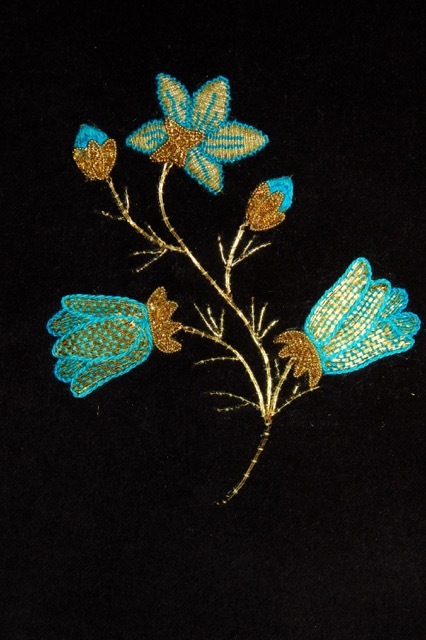 The surface is then stitched with colorful embroidery in a variety of patterns. We used a styrofoam ball for our base and then decorated them with the kiku design. It was a lot of fun, with the wrapping-in-progress balls suddenly escaping our grasp and skittering across the floor. They finally did get covered and ready for embellishing and pictures of the completed temari will appear in a later post. Thank you, Wendy! On Saturday, September 10, 2016, several of us made the trip to Truro to join in with the stitchers attending the Third Annual Maritime Stitch In. The day was beautiful and sunny and everyone was looking forward to many happy hours of embroidery, capped off with a feast of desserts provided by our hosts, the members of the Marigold Guild of Needle Arts. Before everyone left for the day, supplies were distributed for a needlework challenge. Those participating would make a bargello pinkeep. Marie-France Breton has already finished hers and it’s lovely. The date has already been set for next year – September 9, 2017, same location. Thank you very much, Leslie Burrows, for putting so much time and effort into this event. This past Friday, members of our group as well as the Stitchery Guild of Bedford, attended a workshop led by Beverley McInnis, a Chester multi-media artist who took us through a whirlwind tour of the many ways to transfer images and help us explore using it in needlework. After a brief introduction, we were all following Beverley’s lead and experimenting with transfer paints, and even using packing tape! The four hours we had enormous fun learning new techniques and were inspired by the examples of some beautiful finished work which Beverley had brought along to show us. I know I can’t wait to start using what I’ve learned! In April, I participated in a two-day gold workshop, put on by Town Clock Stitchers of Halifax, and instructed by Tanja Berlin of Calgary. Tanja spent many years learning her craft at the Royal School of Needlework in London, England. Her work is fabulous; she had quite a few samples with her to show us, including gold work, blackwork and thread painting. The beauty of her work was truly inspiring. As a teacher, Tanja was terrific. in the group she had both beginners such as myself, and some who were ready to do more advanced work. She balanced the two groups with ease; she would teach a technique and then allow us time to stitch for a bit, offering help when necessary. Then she would go on to the next technique and do the same. There were times of teaching, times of quiet stitching, and times of chatter and laughter. Tanja was very patient and helpful, all the while very relaxed and with a wonderful sense of humour. The venue was a room at the new Central Library in Halifax. It is a fabulous building and it was fun to be there to enjoy the surroundings on our breaks. I thank the Town Clock Stitchers for opening this workshop up to other guilds, and I very much enjoyed my time with like-minded new friends. Here’s the finished work.